We could fair well in this game. Both teams are 5-5 in B1G play. They have lost 4 of the last 5 games, but I believe they have much better overall record. We must get a B1G win. They're different in the way they use their squads. Their starters play the most.... while as we all know.... use the B1G league leading and most productive bench. Indy is not big. So....our length could be big. We're spoiled by the Purdue game and expect us to bury them with ease...but realistically....must put up a big fight. Must not let down,....rather continue to be beast's and on top of our game. Playing at home to a friendly crowd will be another big factor in our favor. They're different in the way they use their squads. Their starters play the most, while as we, all know.... use the B1G league leading and most productive bench. They are not big. So....our length could be big. Thanks steve, I was going to start the game thread but, i have some plumbing problems at home. so forgot all about it. Should get a big game from leigha.playing against home state. here is the Indiana womens message board link. Stats at the end of the First Quarter: Ladies are playing well and off to a good start. Have led by as much as 7 pts. early on. Hoosiers come back, Deadly at their pull-up jumpers while driving to the basket that are hard to defend. Both Cain & Nicea on the bench for a good portion ot 2Q due to foul trouble. 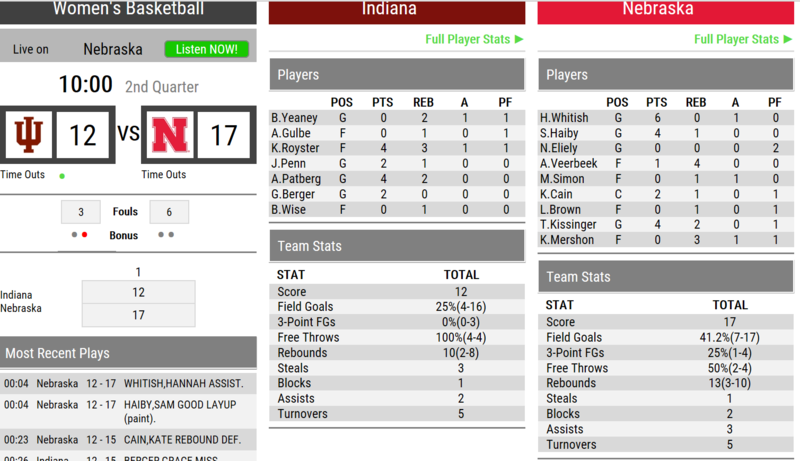 Husker Ladies are playing hard (and well), but missed a couple of easier shots under the basket, trying to much to hurry it up and missing FTs (2-6 vs 6-6 for IN). A close game as everyone expected. 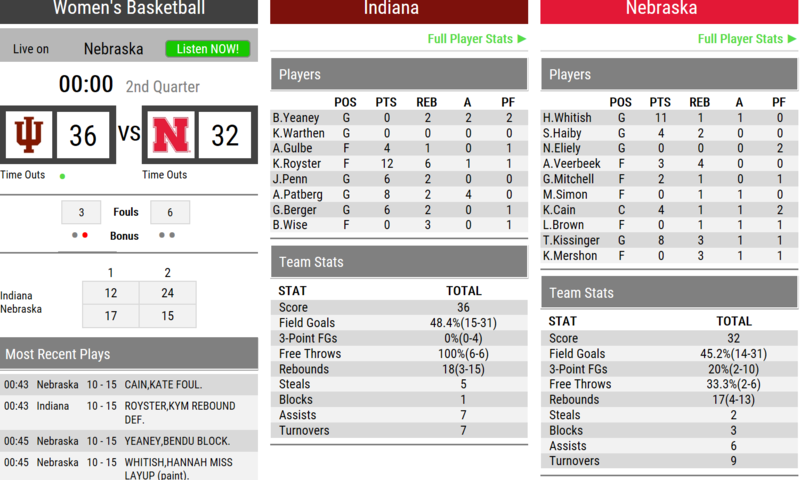 IU scoring at will right now; need to amp up that D in the second half. Why are we not running a zone and fill up the lane ? The team wearing red looks ready to play today. Unfortunately, we're wearing white. Still time to turn it around. Stats at the end of Q3. 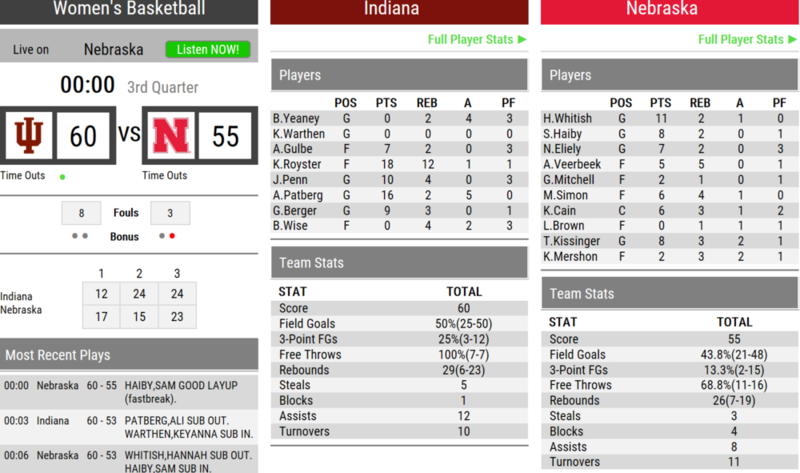 Five Point game, Husker Ladies Rallying Back, Hoosiers with 4 players in foul trouble with 3 each. husker ladies having trouble finishing at the rim. I'm probably all wet and it wouldn't have made any difference, but when we used the zone defense, we really slowed them down. Why not keep using it in the second half ? Another tough loss. We are so close. We can’t waste possessions. At this level if You are open more than occasionally it’s because they want you to shoot. We gotta quit settling. Bigs need to quit shooting 3s. Wasted possessions. They are shooting below 25 percent for the season as a unit on significant volume— it’s not a good shot. Indiana matched up well with us because of their quickness and dribble drive ability. All conf. home losses have been to middle and upper level opponents at this juncture, but another one at home stings. Need to defend home court better but that won't be easy at this point. Maybe we can sweep Purdue, but the other two will be even tougher. I trust the ladies will keep fighting to get better overall and be more consistent on 'O'. GBR!! Didn't get to watch or listen to the game. Spent afternoon at verizon getting a new phone. wife dropped and broke hers. anyway looks like we are reverting back to last years free throw shooting team just looking at the stats. Couldn't agree more with @kansashusker. We have any number of players that can make the big three, Kissinger, Maddie, etc, etc. When they are falling it's fine, but we are just too inconsistent (4-23; 18.2%) in both our shooting, and rebounding, to think we can (or should) rely on the Three Pointer. And all those missed FT's. 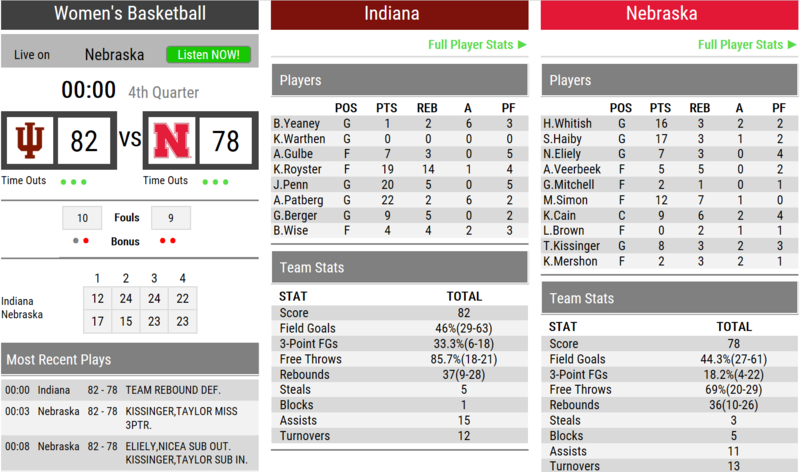 Indiana's offense is better (and more consistent) in the paint. They drive to the basket (make it) and get a Plus One. So many times on our drives we Don't make the basket and (if there's a foul) Might make the FTs. Almost each game Kate is getting outplayed by the other teams post players. Can't win against the good teams on a regular basis with an average center. Didn't she have a knee injury or an injury of some type last year? Must be still affecting her, as someone here pointed out earlier in the season if I recall correctly. I suspect some lingering issues with that plus her size is inhibiting her. I hate to mention weight with relationship to a woman, but it looks like she is a bit bigger than last year and she probably needs to shed some off for next season to try to regain some quickness. Indiana impressed me with their ability to recover on defense and get around or fight through screens. Our 3 point percentage was low because we got very few quality looks, nearly everyone was pressured. Conversely, we could not recove as well on defense and the Hoosiers had more open looks that fell in the 2nd half. I thought Maddie Simon gave us a lift today. I love the teams grit grit and fight. I sometimes am confused by our substitution patterns, why take out a hot player. The 1-3-1 zone was solved and allowed IU to run off too much clock late in the game. They were a tough matchup for us. I am mesmerized by the lack of energy we play defensively in the second quarter. It has been an eye sore all season long. Starting the third quarter twice Kate was guarding point 27 feet from the rim and no one was filling the lane. Have idea how or what we were defending for half of the third period. Here's your open lane without obstructions please drive. Finally was it me or did the refs seem to have it in for Nicea. Seriously fouled on a made lay up. I was cheering for the and one opportunity only to find out they called the most BS traveling call I have ever seen. Two of the fouls they called on her were also complete BS. Sorry you had witness that Actualfactual. Lastly we used dribble penetration to attack the rim in the first, back half of the third and fourth periods and we won that. Sports 101 make the opponent stop what is working. We should have stayed with throughout the game. expected Patberg to get her points. i thought if they could limit Penn and/or Wise Huskers had great shot at getting a win at PBA. sure, Royster had to have her game of the season, so far anyway. i think she averaged 6.3ppg. as mentioned earlier, i agree with some of the comments about Cain. i would like to see her get in a little better shape for next season. her drifting out to play defense at times has always driven me crazy. i was pretty surprised to see minny upset rutgers 60-46 (@williams). wondered how that happened so looked up some stats: Rutgers shot 33.9% in fg's. 15.8% 3pt'ers. 50% at the free throw line (5-10). i thought minny must have been HOT shooting: not so, minny shot fg's at a 32% clip, were 23.1% from 3. where minny won this game was at the free throw line. they shot 80.6% (25-31). big discrepency in free throws. also, minny practically played 5 players for the game. 2 other players got 4 minutes each (includes Lamke who has started at post most of the season) and i think one other player saw very minimal time (a little over a minute i think?). Bello had 21 rebounds---pretty impressive against a team like Rutgers, or anyone as far as that goes. - Senior forward Caitlin Jenkins has been suspended indefinitely for a violation of team policy. threw at them. We didn't have the answers. Might have been out coached in this one, (preparation and game day). There was an element of Indiana had us well scouted. They knew how to defend us, and how to score on us. And we never adjusted. From a coaching standpoint we got our hats handed to us. But that's not unusual in the business......can you coach and be successful game in and game out ? ...It's a tough job. Indy reminded of Drake somewhat....very disciplined on offense and defense.